I'm sorry this has taken a while for me to post but this is the first day I have had time to post about it. Grandbaby is doing fine and husband is better each day. Good Luck, I'm not sure when I will have the drawing at this time. I still have a lot to do on the wall hanging which is turning out a little bit large by the time I add the border. I just start drawing it out and I should do better on measurements. Could be a cute tablecloth for the Spring. Touch of buttons and 3/D flowers and the worm needs some personality added. She does beautiful work and this will be done at another time, but I'm in a hurry with this pattern. 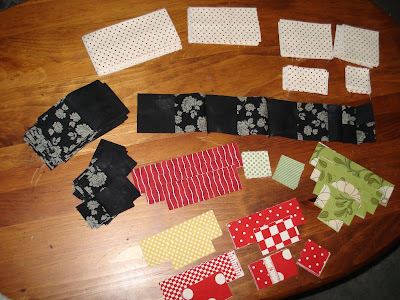 I have projects with handwork lined up for the rehab visits already. (Tea Swap and PIF, can't show them)Husband is doing a lot better and I want to thank you for all the well wishes. First Grandbaby trip to pre-op for hospital!!! I have to tell you a quick story about our grand baby's visit to get ready to get her tonsils out. She will have surgery Tuesday and this was to take blood before surgery. All the way there she was just picking at her baby sister telling her, "You have to get a shot" and my daughter did not tell her any different or correct her because she is our drama QUEEN. They go in and when my daughter put her in the chair instead of baby sister, she took off. Now our daughter is expecting and she takes off after her. They get her back in the chair and they have 3 ladies holding her. She is really a good child except for shots or doctor visit. This is what this little 4 year old is shouting at the top of her lungs. "God help me, God help me!!!" The nurse tells her "That's the one Person to go to asking for help honey." She already knows who to call on. I'll have pictures of the quilt top tomorrow. 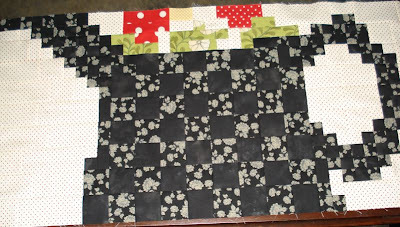 Not quilted yet, but coming along. I won Lani's giveaway on Whirl into Winter, that Debi put together. If you haven't visited Lani's blog, http://www.golanigo.blogspot.com/ you need to go. She is full of life and living with laughter. Look at what all she sent. Thank you so much Lani. Lani is having a Valentine giveaway that is going to be fun. She will be adding gifts through out and you have to be able to know what she has added to get your name in the hat more than once. This is what she has started with and that is a loot in itself. 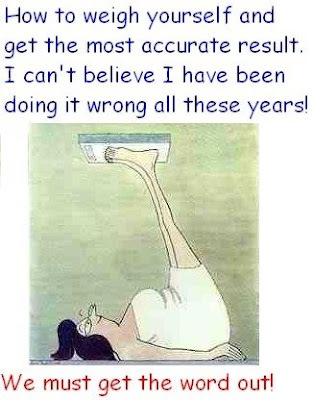 I promise I didn't weigh like this...but I did lose 3 lbs. Off to the hospital tomorrow and husband will be home for 4 weeks. He wants to lose weight too, so I'm going to cook low fat while he's off and we have to start exercising. Can't wait for all the low fat desert recipe's you ladies will come up with. 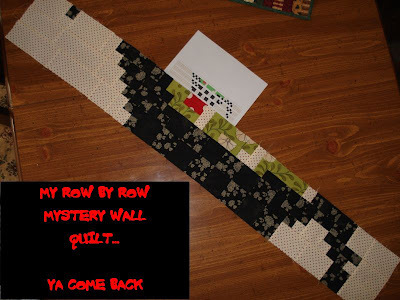 I'm fixing to sit and sew again, but wanted to show the progress on the wall hanging. 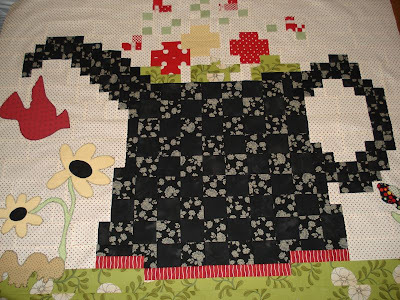 It will have applique added after I get the quilt put together. My husbands surgery is scheduled for Tuesday, so I wanted to get it further along so I could do some handwork. This wall hanging came about to put in my sewing room. Well we just got a new bedroom set and I moved the antique armoire into the sewing room. If you could see my little room, it is almost wall to wall furniture. I'll have to take a picture after I get it all settled. I'm not sure there will be enough wall space to hang this. 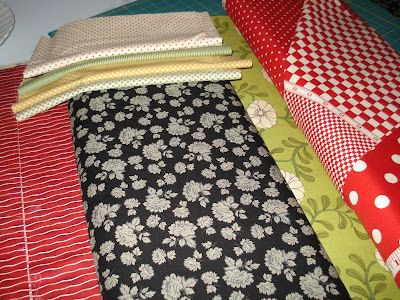 I've got the curtain fabric bought and just need to decide how I'm making them. Be watching for my 100th post giveaway coming soon!!! I used the Random Number Service because I didn't have anyone to pick the #. Congratulations Rachel, I'll be emailing you soon. Thank you all for entering and don't forget my 100th post giveaway is coming up soon! Please go down to January 1st Post to enter in the giveaway. Thank you all who have entered and I will have the drawing @ 4:00 pm 1/15/09. I'm almost at my 100th post so I will have another giveaway to celebrate this. How I've wanted to sew. When I get stressed out the sewing machine just calls my name. I was able to sew just a little and it felt like my muscles are getting a little relax. Isn't it funny how sewing makes some people relax and others, it can tie them in a knot. Here is a picture of the wall hanging I'm designing and putting in my sewing room, which I need to take before and after picture of the room. I'm finally home from shows and I really want to fix it up. Look for more pictures to come, I might get a little bit more time in tonight to sew. Yea!!! Today's Dr's visit for my husband-found out surgery needs to be asap because he has a large tear. My brother is still in the hospital, so time is spread thin, but I hope to get around and visit everyone. Isn't this the cutest fat baby, that's what I feel like! I had to cover it's little booty. I know girls I'm suppose to report on diet, I have to get a wide lens for my camera first before I can show a picture. Well I've tried to be good and ate as healthy as I could on the road, but no exercises. I have to do this to make any progress. I promise I will do better next week. Sharon, don't crack that whip to hard. Let's see where do I start. My husband went for an MRI today, because he lifted a deer up and tore his rotators cuff. (We found out today) I told him every time he took a bite of deer meat I was going to say $50.00 ching ching. He told me by the time it's over with, it will probably be $100.00. Then my daughter called, just got back from the Dr's office with 1st grand baby. Tonsils and adenoids need to come out. Then I got a call from the hospital, my brother has been admitted. I just got home and it is 2:00 AM. I'll have to go back in the morning, not sure what is wrong. I'll try to get back to posting later. New Pattern Coming Soon! Blog Buzz! Look at these colors, but I promise it's going to look great when it's through. Hopefully by next week I'll have it quilted and finished. Blogland has great news traveling from blog to blog. Just look at the side bar for all the things going on. All the goals we have set and WILL accomplish is being read by everyone and I know all of us can do it. What is that saying, "We are Women and we are Strong". I'll be checking on everyone, if it's faith, weight, projects, health, better jobs, etc. We can do it!!! I'll be posting sewing projects, recipe's for us trying to lose weight and trash to treasures this year (at least that is my goal) to do list. 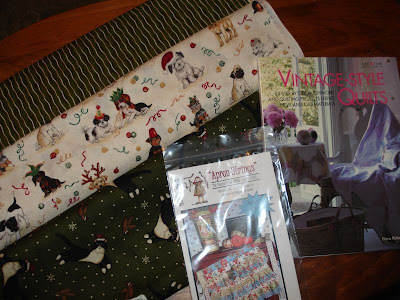 Have to remind you, please go below for a chance to win prizes=six new Romantic Homes Magazines, fat quarters, quilt book, apron pattern and no telling what. I joined Linda's PIF so you know what that means, I need to do the same. So here are the rules and we are doing handmade gifts. I get so excited about this and can't wait to get started. OK Sharon, here goes, I got out today and bought oranges and grapes, they looked pretty good. I baked a chicken with carrots, celery and new potatoes with Lipton onion soup mix and we had string beans with this. I thought I did pretty good for the first day. Now I need to go and get new shoes for some kind of work out. I'm not as brave as you on showing pictures but will have a lb lost post. Come on girls we can do this. Don't forget to sign up for the Whirl Into Winter giveaway in the post below!!! I've been busy and non-stop since before Christmas and I hope to slow down now. My friend Jeanie and I had a booth in Dallas with Antiques and we closed it this week. It's sad for us to end this part of the adventure, due to the economy. She lives in Dallas and I'm 5 hours away, but we hope to still stay in touch. It was a lot of hard work, but we had so much laughter that went on, when the two of us got together the hard work was just looked over (except when we couldn't walk cause our feet hurt so much). 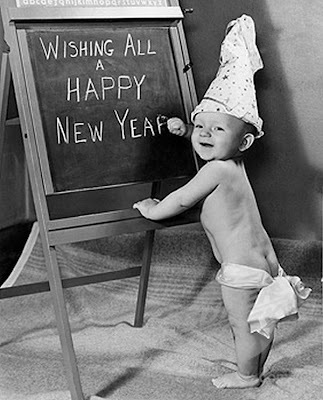 Now for the New Year, I pray that everyone has a great year to come their way. Time for New Beginnings. . . . . . . . . . . Remember each experience for the good that has come of it and for the knowledge you have gained. "The winner of the magazines is-Drum Roll Please---"
I'm off to email Janet and I'm sure she can use the magazines to read living up North. 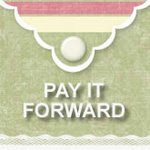 Click on icon to go to her giveaway blog and read all about it. I guess I've been getting on the computer and getting off to fast and didn't read about this event. 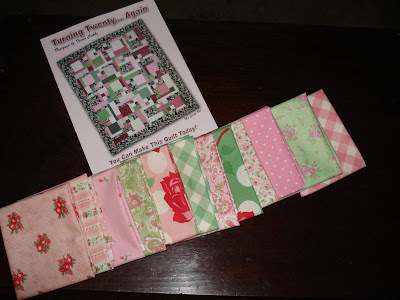 I'll be giving away the 6 magazines again, fabric and patterns to help keep you busy for the winter months ahead. I'll post a picture of it all tomorrow. Sorry my camera is full. You can post here or anytime on a post after this one. Just let me know what your goal is for the oncoming year. 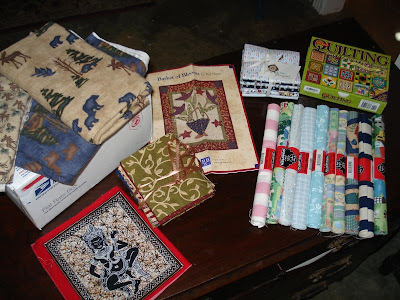 Here is the picture of the fabric-fat quarters cut, book-Vintage Style Quilts, apron pattern and the 6 new magazines listed in post below will be in the giveaway. I thought this fabric could be used for the upcoming projects for Christmas next year. I will be back soon to show the pictures of the new projects I'm working on.